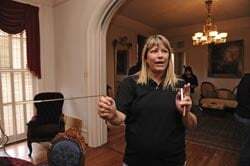 Becky Nagel holds an old-fashioned dowsing rod, usually used to locate water under the surface, which she said will spin on its own when spirits are disturbing a room’s atmosphere. Rita Garcia holds a special camera designed to capture electromagnetic disturbances in the East Terrace ballroom. Tony Ramos checks the energy levels in the house’s first-floor drawing room. Scott Nagel hands out trifield meters from the society’s trailer, which is loaded with about $20,000 in special equipment. The meters measure electrical interference within electromagnetic fields — an indicator that spirits are close by. Members of the Central Texas Paranormal Society team gather in the drawing room at East Terrace, a Historic Waco Foundation house where they recently spent a night checking for paranormal activity. Shown are Valerie Fairly (from left), Tony Ramos, Lee Smith, Scott Nagel, Rita Garcia, Jane Brown, Becky Nagel, Ed Viera and Ken “Pop” Hotchkiss. Ken Hotchkiss and Lee Smith see dead people ... and talk to them. And sometimes they hear something back from the other side. Some folks might think the father-daughter duo are already “out there” in their interest in ghosts, spirits or spooks. They founded CTPS in 2004 to seek answers to their questions about the great beyond. Smith said her definition of spirit is broad enough to encompass ghosts or angels — even demons. Hotchkiss, raised a Seventh-day Adventist but now a “free-range” seeker of sorts, said he believes the truth is “out there,” and he hopes to find it through the scientific method. He employs infrared video cameras and still digital photography, takes digital temperature recordings and captures digital voice recordings in pursuit of elusive and often inexplicable phenomena. “You’re only as good as what you can back up,” Smith concurred. In the eight years since their launch, they’ve acquired equipment and accessories they value at about $20,000 to conduct paranormal probes. The 12-person team conducts some 25 investigations a year, virtually every other weekend, Hotchkiss said. Members have roamed as far north as Denton (looking for the ghosts said to frequent the boiler room of Bruce Hall on the University of North Texas campus) and as far south as Port Isabel. Usually they are approached by a homeowner or a business owner. A date is agreed upon for an evening-long investigation, which generally lasts from 6 p.m. until 1 or 2 a.m.
Smith said she tries her best to screen requests for serious inquiries only. “We want to be respectful and give everyone the benefit of the doubt, if we can,” she said. After a walk-through with the client, with an explanation of what phenomenon is being experienced where, the team sets up its equipment in several locations, and members split up in pairs to monitor the activity. All cases are confidential, unless the clients themselves choose to disclose their involvement. For example, CTPS was recently engaged by Historic Waco Foundation to check out the vibes at East Terrace, as part of the preparations for the house museum’s autumn exhibit (see sidebar). 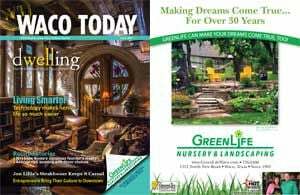 Earlier this summer, the paranormal team spent an evening prowling the house and grounds of the circa 1872 Italianate villa at 100 Mill St.
Holly Browning, curator of collections and interpretation at Historic Waco Foundation, said CTPS was one of several paranormal teams interviewed for the task, before being given permission to test for incorporeal residents. About a month after the initial data-gathering, Hotchkiss and Smith presented a brief report to the HWF board on their findings. Nothing unusual turned up on the videos or stills, she said, but the board was presented a compact disc with six “voice” recordings — mostly one-or-two-word phrases hard to discern. “We’re certainly not opposed to working with them again on some future investigation,” Browning said. CTPS does not charge for its services. It accepts donations, though, to help fund their work. “Especially for gas,” Smith said. “But usually, we’re pretty happy for a plate of sandwiches and a pot of coffee,” her father added. • Ken “Pop” Hotchkiss — Founder and lead investigator. He is a retired federal employee and former U.S. Marine. • Scott Nagel — Tech manager and Becky’s husband. He’s a retired U.S. Air Force electronics technician who works for L-3 and bills himself as the resident “debunker of the team,” looking for any logical explanation to the unorthodox happenings they encounter. • Rita Garcia — Investigator and video specialist. She is a bilingual X-ray technician. • Dana Koester — Investigator and evidence analyst. She is a retired postal employee. • Ed Viera — Investigator and evidence analyst. He is chief flight instructor for Texas State Technical College-Waco. • Valerie Fairly — Investigator and evidence analyst. She is a correctional officer at a state maximum security prison. • Jane Brown — Part-time investigator. She is a grandmother and hospital clerk. • Jackie Fife — Investigator and evidence analyst. She is self-employed. • Tim Fletcher — Site moderator and part-time investigator. • Tony Ramos — investigator-in-training. He works at L-3 and brings three languages to the table — English, Spanish and Hebrew. General admission tours: 2 to 5 p.m. Saturdays and Sundays, at the regular admission price. Visitors will learn about Victorian funeral customs and the Spiritualism movement. East Terrace House Museum, a circa 1872 Italianate villa, will be “dressed” for an 1880s funeral, and the double parlors will be prepared as for a wake. The upstairs ballroom of the mansion will be set for a seance. This is not a haunted house tour. There will be no gore, disturbing images or activities meant to frighten visitors. Special “twilight” tours with the exhibit curator (reservation-only event) cost $10 per person. Tours will take place at 7 and 8 p.m. Oct. 6, 13 and 20. Call 753-5166 to save a spot. A special “open house” with the Central Texas Paranormal Society will take place from 7 to 9 p.m. Oct. 27. Tickets remain $10 for admission, but no reservations are required for this twilight tour.